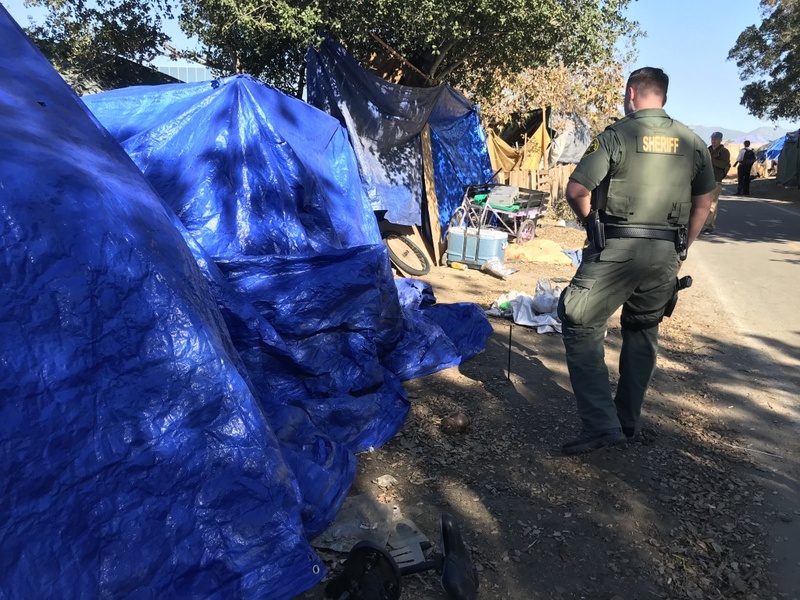 Orange County sheriff's deputies on Monday began going tent to tent along the Santa Ana River telling people the area will be closed and they need to move. 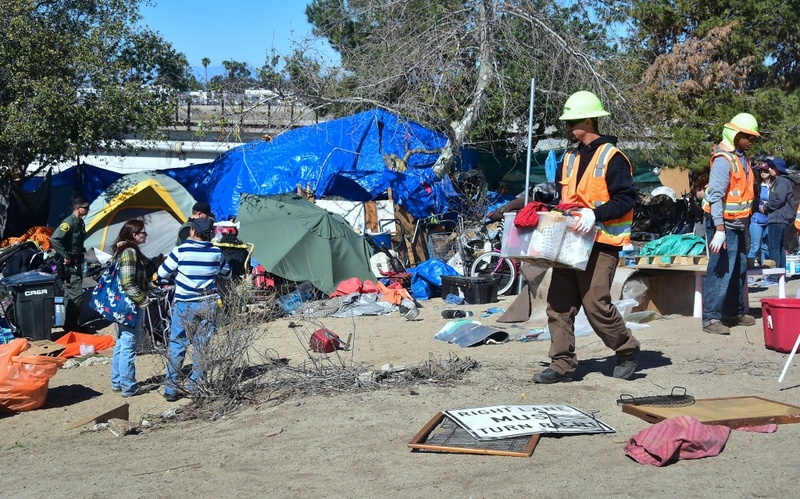 It’s been a whirlwind since Orange County officials moved in January to dismantle the sprawling Santa Ana River homeless encampment. The 2-mile long collection of tents and makeshift shelters had become an eyesore, a public health hazard and, in the eyes of some, the epitome of public neglect in one of the nation's wealthiest communities. 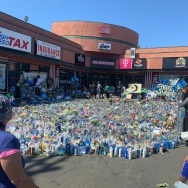 The mass eviction of some 700 people captured headlines across the country, as did a massive citizen protest last week against a plan to set up emergency homeless shelters in three OC communities to accommodate the displaced. Here are the basics about where the county's homeless crisis is now at and how it got there. Two federal lawsuits filed on behalf of homeless people living along the river forced the county to put roughly 700 people evicted from the encampment into motels for a month, starting in mid-February. During their month in motels, around 600 people were assessed by county social workers to determine their needs for housing and services, such as substance abuse treatment and mental and physical health care. According to county figures, another 70 people were evicted from motels before they could be assessed, while others left the motels on their own. At the end of the month-long motel stays, about half were successfully moved into shelters or other housing with services. Around 200 others, according to the county, declined services or didn’t show up to accept them. Carol Sobel, one of the lawyers for the homeless plaintiffs and a dogged litigator of homeless issues in L.A., said she disputes some of the county’s figures. She also said she’s concerned that some of the services offered to homeless individuals have been inadequate or inappropriate. “It’s time to go back and check some of these things that fell through the cracks,” she said. Under pressure from U.S. District Judge David Carter, who is overseeing the legal cases, the county Board of Supervisors approved a plan on March 19 to potentially open temporary shelters in Irvine, Laguna Niguel and Huntington Beach. 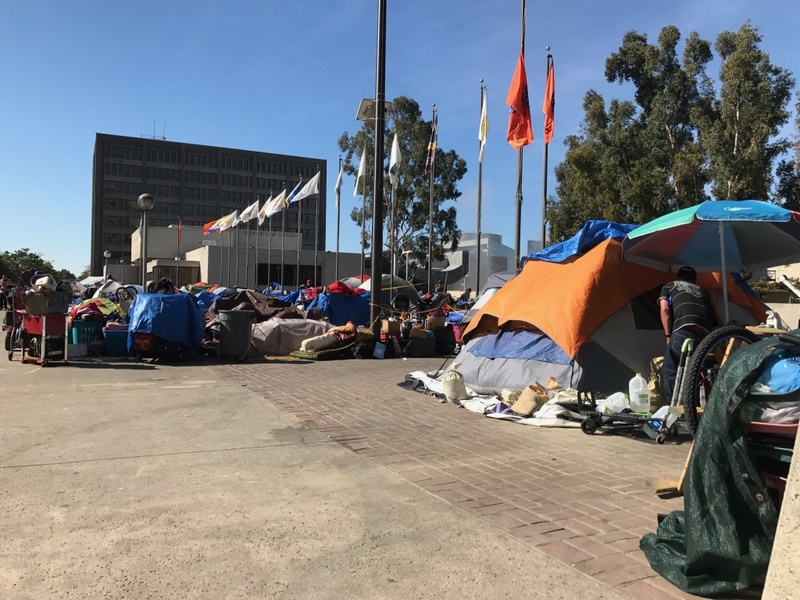 Judge Carter had warned county and city leaders that available shelter space was inadequate to meet the needs of those transitioning out of the riverbed, plus an additional 150-200 people who are scheduled to be removed from the Santa Ana Civic Center by the end of this week. U.S. District Court Judge David Carter talks to advocates for the homeless outside of a court hearing on homelessness on March 17, 2018. Orange County leaders and homeless advocates have praised the judge for forcing the county to address chronic homelessness. On top of those numbers, the county’s two winter shelters in Fullerton and Santa Ana are scheduled to shut down for the season in a few weeks, potentially leaving several hundred more people without a place to sleep. But county supervisors backtracked on the plan to open new emergency shelters after more than a thousand people showed up at a board meeting last week, many of them brought in on buses chartered from Irvine, to protest the plan. 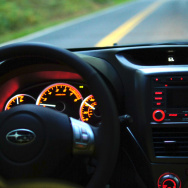 The cities of Irvine, Laguna Niguel and Huntington Beach also threatened to sue the county. Will cities step up to offer shelter sites? On Tuesday, Judge Carter held a packed hearing at the federal courthouse in Santa Ana. He invited the mayors and city managers of all 36 Orange County cities to attend. At least one-third of them did. 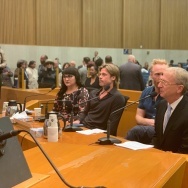 At the hearing he warned city and county leaders that legal precedent, primarily the case Jones v. City of Los Angeles, would prohibit them from enforcing anti-camping laws or otherwise kicking homeless people off streets and out of parks unless they had appropriate shelter space to accommodate them. 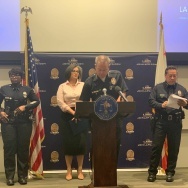 He also said central Orange County, especially the cities of Santa Ana and Anaheim, had hosted the lion’s share of the county’s unsheltered homeless population for too long. He challenged cities in south OC and along the coast to come together to find acceptable sites for emergency shelters. "Find me a location,” he said. Irvine Mayor Donald Wagner defended his city's rejection of the temporary shelter site proposed there. He said it had no running water or electricity and was still contaminated from its time as part of the El Toro Marine Corp Air Base. A homeless encampment located around the Santa Ana Civic Center in Orange County. Wagner and other south county mayors have committed to exploring alternative shelter sites. They’re scheduled to discuss options at a meeting on April 19. In the meantime, it’s unclear whether there’s enough shelter space to accommodate the homeless people currently sleeping in the Santa Ana Civic Center, if they’re evicted. Santa Ana Police Commander Ken Gominsky has said he won’t force people to move unless they have options. 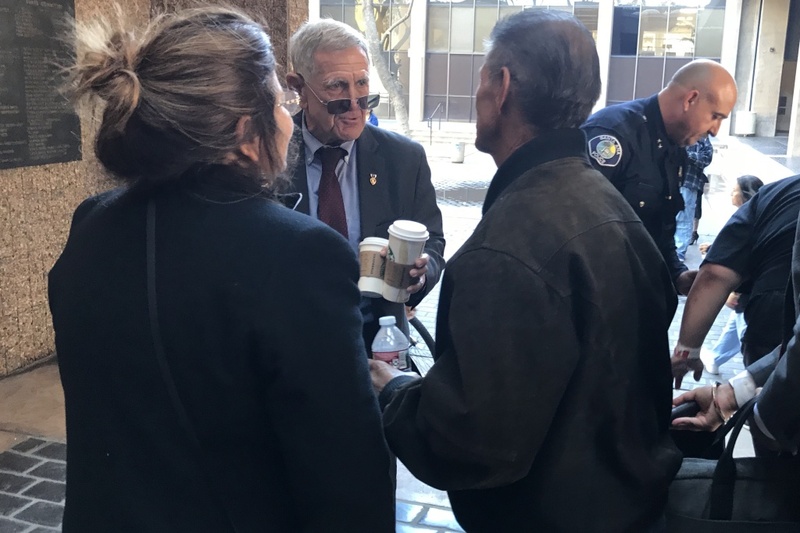 Fullerton Mayor Doug Chaffee said he had put in a request with the National Guard, which owns the cold weather shelter in his city, to stay open longer this year in order to stave off a new influx of homeless people onto the streets.